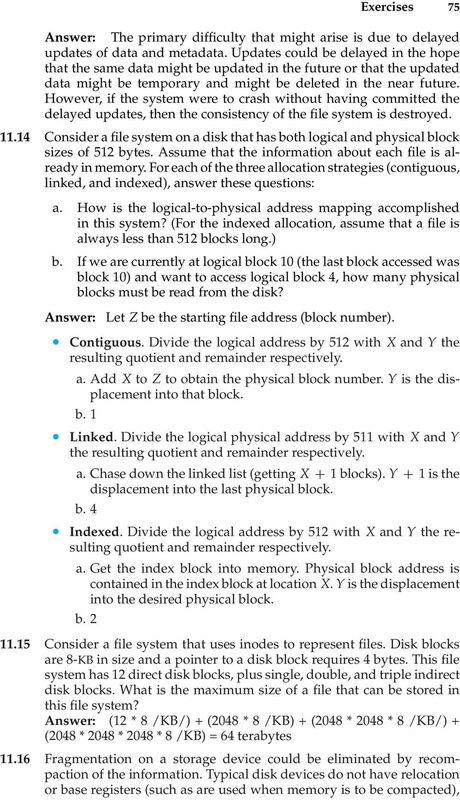 2 74 Chapter 11 File-System Implementation pointers stored in the FAT as opposed to accessing all of the individual blocks of the file in a sequential manner to find the pointer to the target block. Typically, most of the FAT can be cached in memory and therefore the pointers can be determined with just memory accesses instead of having to access the disk blocks Consider a system where free space is kept in a free-space list. a. Suppose that the pointer to the free-space list is lost. Can the system reconstruct the free-space list? Explain your answer. b. Consider a file system similar to the one used by UNIX with indexed allocation. How many disk I/O operations might be required to read the contents of a small local file at /a/b/c? Assume that none of the disk blocks is currently being cached. c. Suggest a scheme to ensure that the pointer is never lost as a result of memory failure. Answer: a. In order to reconstruct the free list, it would be necessary to perform garbage collection. This would entail searching the entire directory structure to determine which pages are already allocatedtojobs.thoseremainingunallocatedpagescouldberelinked as the free-space list. b. 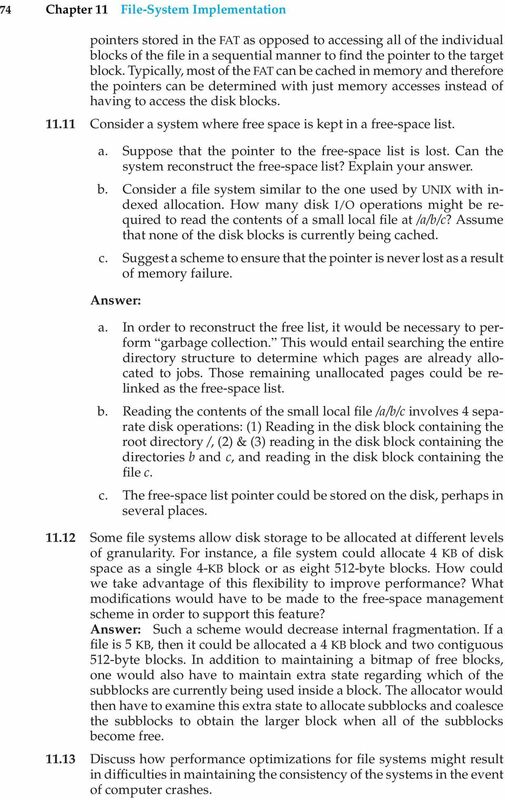 Reading the contents of the small local file /a/b/c involves 4 separate disk operations: (1) Reading in the disk block containing the root directory /, (2) & (3) reading in the disk block containing the directories b and c, and reading in the disk block containing the file c. c. The free-space list pointer could be stored on the disk, perhaps in several places Some file systems allow disk storage to be allocated at different levels of granularity. For instance, a file system could allocate 4 KB of disk space as a single 4-KB block or as eight 512-byte blocks. How could we take advantage of this flexibility to improve performance? What modifications would have to be made to the free-space management scheme in order to support this feature? Answer: Such a scheme would decrease internal fragmentation. If a file is 5 KB, then it could be allocated a 4 KB block and two contiguous 512-byte blocks. In addition to maintaining a bitmap of free blocks, one would also have to maintain extra state regarding which of the subblocks are currently being used inside a block. The allocator would then have to examine this extra state to allocate subblocks and coalesce the subblocks to obtain the larger block when all of the subblocks become free Discuss how performance optimizations for file systems might result in difficulties in maintaining the consistency of the systems in the event of computer crashes. 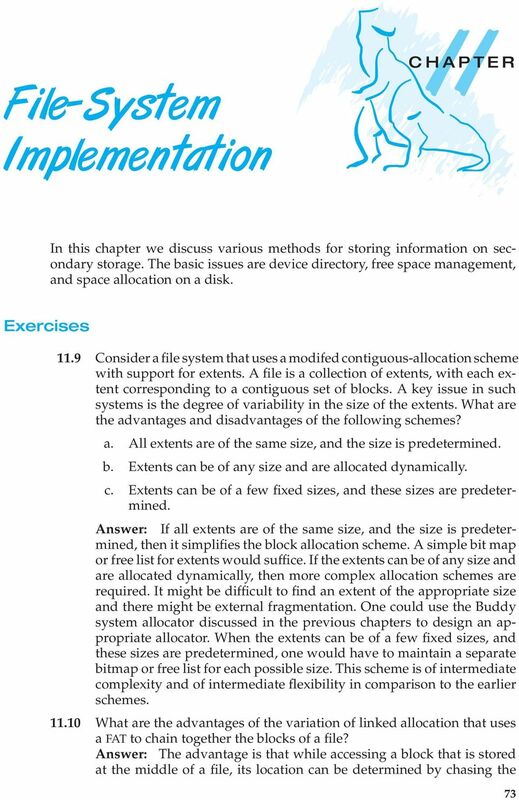 4 76 Chapter 11 File-System Implementation so how can we relocate files? Give three reasons why recompacting and relocation of files often are avoided. Answer: Relocation of files on secondary storage involves considerable overhead data blocks have to be read into main memory and written back out to their new locations. Furthermore, relocation registers apply only to sequential files, and many disk files are not sequential. For this same reason, many new files will not require contiguous disk space; even sequential files can be allocated noncontiguous blocks if links between logically sequential blocks are maintained by the disk system In what situations would using memory as a RAM disk be more useful than using it as a disk cache? Answer: In cases where the user (or system) knows exactly what data is going to be needed. Caches are algorithm-based, while a RAM disk is user-directed Consider the following augmentation of a remote-file-access protocol. Each client maintains a name cache that caches translations from file names to corresponding file handles. What issues should we take into account in implementing the name cache? 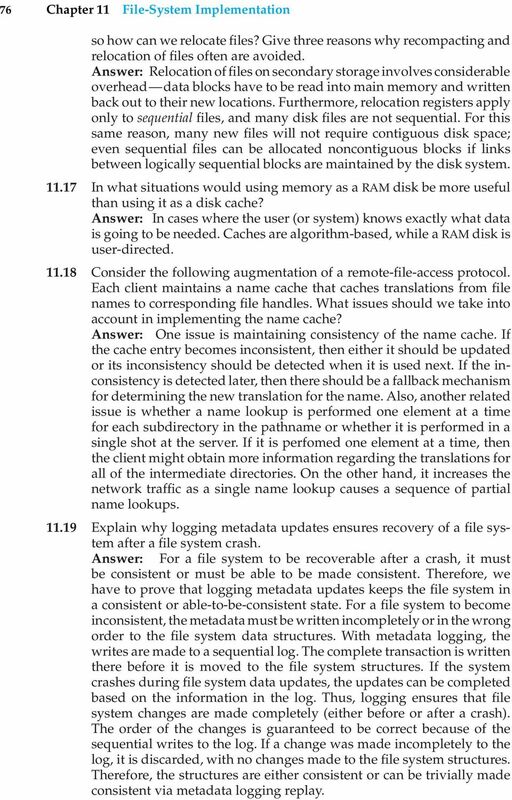 Answer: One issue is maintaining consistency of the name cache. If the cache entry becomes inconsistent, then either it should be updated or its inconsistency should be detected when it is used next. If the inconsistency is detected later, then there should be a fallback mechanism for determining the new translation for the name. Also, another related issue is whether a name lookup is performed one element at a time for each subdirectory in the pathname or whether it is performed in a single shot at the server. If it is perfomed one element at a time, then the client might obtain more information regarding the translations for all of the intermediate directories. On the other hand, it increases the network traffic as a single name lookup causes a sequence of partial name lookups Explain why logging metadata updates ensures recovery of a file system after a file system crash. Answer: For a file system to be recoverable after a crash, it must be consistent or must be able to be made consistent. Therefore, we have to prove that logging metadata updates keeps the file system in a consistent or able-to-be-consistent state. For a file system to become inconsistent, the metadata must be written incompletely or in the wrong order to the file system data structures. With metadata logging, the writes are made to a sequential log. The complete transaction is written there before it is moved to the file system structures. If the system crashes during file system data updates, the updates can be completed based on the information in the log. Thus, logging ensures that file system changes are made completely (either before or after a crash). The order of the changes is guaranteed to be correct because of the sequential writes to the log. If a change was made incompletely to the log, it is discarded, with no changes made to the file system structures. Therefore, the structures are either consistent or can be trivially made consistent via metadata logging replay. 5 11.20 Consider the following backup scheme: Day 1. Copy to a backup medium all files from the disk. Exercises 77 Day 2. Copy to another medium all files changed since day 1. Day 3. Copy to another medium all files changed since day 1. This contrasts to the schedule given in Section by having all subsequent backups copy all files modified since the first full backup. What are the benefits of this system over the one in Section ? What are the drawbacks? Are restore operations made easier or more difficult? Explain your answer. 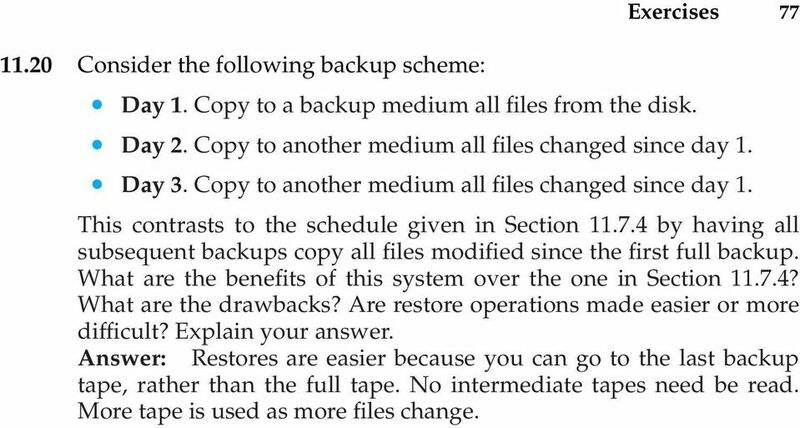 Answer: Restores are easier because you can go to the last backup tape, rather than the full tape. No intermediate tapes need be read. More tape is used as more files change.